This gorgeous dog is believed to have originated in Germany. 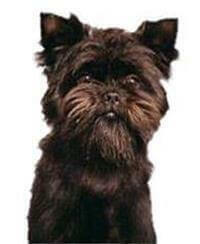 Its name, Affenpinscher, translates as ‘Monkey Terrier’ which describes this little dog very well. In the farmlands of Germany they survived by hunting rats and mice and so protected the farmers' supply of winter food. The two World Wars nearly wiped out the breed, but thanks to some dedicated people it is thriving again. Afghan Hounds will often live up to 13 years of age, but with the proper care and nutrition can live up to 15 years of age. A dog in good condition should be 60cm to 64cm for the female and 70cm to 74cm tall for the male. In peak condition the female should weigh up to 25kg and the male 30kg. The Affenpinscher is a quaint, comical dog that loves company, and loves to show off to their owners. They are eager to please, usually quiet and they will only bark if something unusual is happening within its territory. They are not really happy in a kennel, but will adapt. These happy dogs will mix with almost any other pets in the household, especially when they are raised together from and early age. The Affenpinscher needs little grooming, just a weekly comb or brush and a bath occasionally. You will need to trim the hair around its feet and keep its toe-nails trimmed, but they do prefer the scruffy look - this helps with the hair around the face hence the popular name ‘Monkey Dog’. Ideal owners are people who have small back yards and are willing to take them for walks. Once you have an Affenpinscher, it will finish up ‘owning you’ and not the other way around. For those people who do not have a lot of room, but still want to have a dog of their own that they can love then this smart little animal is well worth considering. If you need more information on the Affenpinscher contact the breed club within your county and they will only be too happy to help you.